It had to be Leo's Grandevous. Frank Sinatra was born in Hoboken, New Jersey and while Ol' Blue Eyes may be gone, he is still very much alive at Leo's Grandevous. This institution was opened in 1939 by Sinatra's childhood friend Leo DiTerlizzi and his wife Tessie. Whereas Frankie's rise was meteoric, expansion for Leo's Grandevous happened "one customer at a time." What was once a bar that served food which Tessie cooked in her apartment upstairs, has become a full fledged Italian restaurant with multiple dining rooms and a juke box jam packed with all the music you want - so long as it's sung by Sinatra. Beyond the food, Leo's Grandevous is a shrine to Frankie. Countless photographs, artwork, and near-life sized cut-outs of Hoboken's favorite son line the walls. There's even a bar stool with his name on it, literally. Oh, and there is a pizza section on the menu. 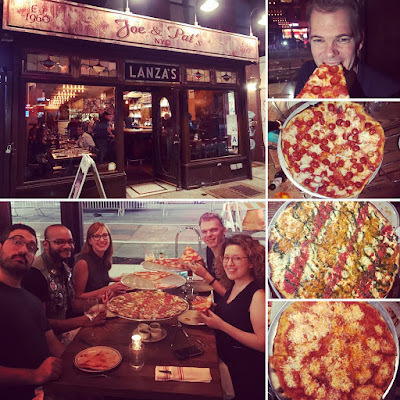 They serve 8" bar pies that pair perfectly with many of the offerings at the full bar - or as an appetizer for what Leo's know for: old fashioned Italian cuisine. Leo's Grandevous is far from the only place where you can eat pizza and listen to Frank Sinatra but it's the only place where it feels like he's on the other side of the table. 1. Adam Wade is an amazing story teller. He taught me how to do it in front of an audience. He should know, he's won the Moth over 20 times. 2. Holy Canoli! After pizza, Adam Wade bought me a canoli! 1. Adam Wade has a Facebook Live TV show called "On the Bench." He tapes it most every weekend from the streets of Hoboken. Friend him on Facebook and tune in!